This post comes in light of the recent plastic bag charge that has come into practise in England to significantly reduce the public’s use of plastic bags and encourage people to reuse, recycle and ultimately waste much less. There is the strong hope that this change will create a £60m saving in litter clean up costs and £13m in carbon savings over the next decade. It just shows the massive improvements and savings that can be made if we all just think and plan a bit better. We just have to make sure we remember to take our bags with us now! On another note, have you ever had no choice but to buy a huge pack of fresh pasta, a big pot of yoghurt or a supersize punnet of fruit and end up wasting half of it? Well you’re not alone as according to studies, 12 million tons of food waste is dumped in landfills each year, which equates to about a third of all food that is bought. German duo Sara Wolf and Milena Glimbovski have taken the first supersized eco step in an experiment to see whether the elimination of all disposable packing and therefore creating a more efficient shopping system will help reduce this pretty shocking statistic. 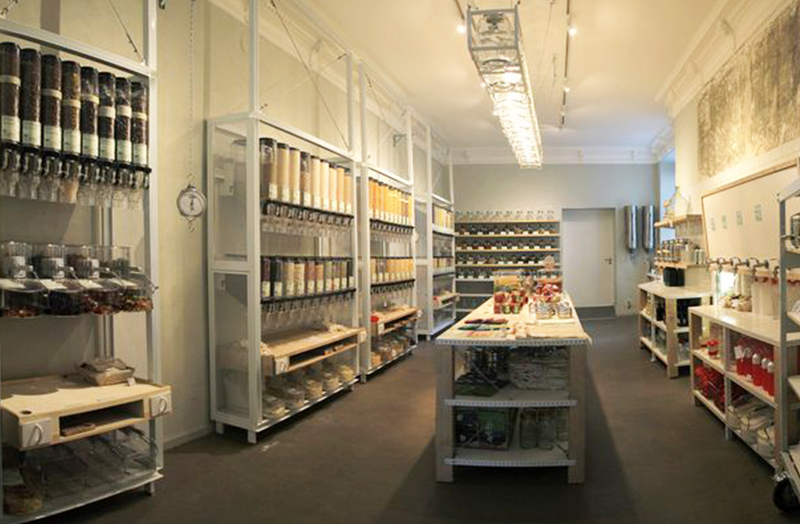 They have opened a zero waste supermarket (Original Unverpackt) in Berlin taking the idea of eco shopping to another level. How it works is you bring your own container, this gets weighed before you shop, you go and carefully dispense just the right amount of anything you need from pasta and grains, to cheeses and shampoo and then the weight of your container is taken off the total weight. These refillable containers can be used over and over again therefore eliminating waste in not only the products but the packaging as well. There is no doubt that society is definitely getting better at waste reduction, however there is still a long way to go to make sure we love and respect the country we live in. So although you might not have a zero waste supermarket around the corner from you, just take that extra minute to see how you can contribute to reducing the huge amount of unnecessary waste we are guilty of.